Numerous studies have found widespread age discrimination in the work place, from refusal to promote to forced retirement. Stereotypes in hiring also abound. Older jobseekers are stereotyped as slow, resistant to change, incompetent, difficult to train, and having physical limitations. So why do younger workers—despite their inexperience—often get preference in hiring? Why do nearly two-thirds of workers age 45–74 say that age discrimination is common in the workplace (Older Workers in an Uneasy Job Market)? And why are more than 20,000 age discrimination cases filed with the U.S. Equal Employment Opportunity Commission each year? Because age discrimination is rampant in our workplaces and society. And it has a devastating effect on the financial security and independence of older workers and their families. 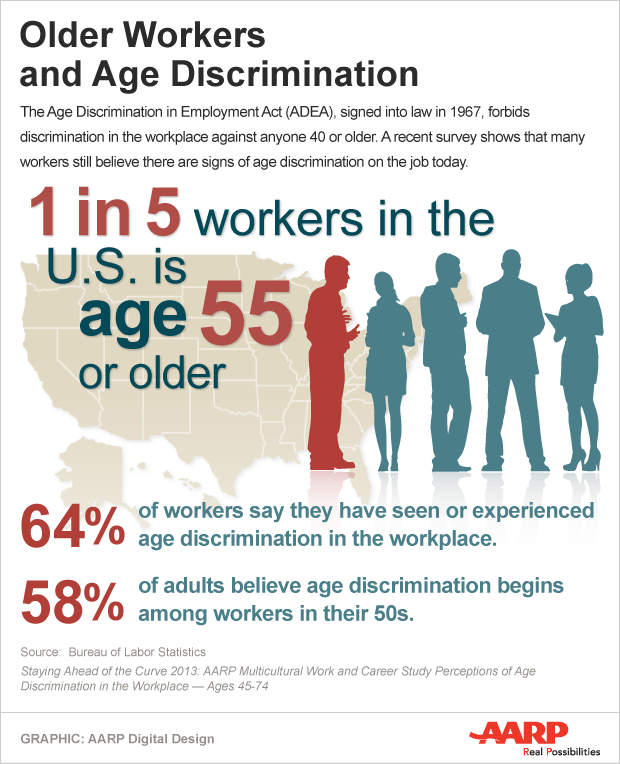 Currently, age discrimination cases are virtually impossible to win. That's because age discrimination is often part of a mixed motive. In June 2009, the Supreme Court decided that a complaining party must demonstrate that age or retaliation was the sole cause of a discriminatory practice—which is not the case with race, gender, or religious discrimination (Supreme Court Rejects Mixed Motive in Age Discrimination Case). In July 2013, Senator Tom Harkin of Iowa and bipartisan members of Congress introduced legislation (S1391/HR2582) to amend the Age Discrimination in Employment Act of 1967 and other laws to clarify appropriate standards for Federal employment discrimination and retaliation claims, and for other purposes. If approved, the amendment would establish the same burden of proof for age discrimination that exists for other forms of unlawful employment discrimination. For more information, I invite you to read my October 2014 guest editorial, "Dispelling the myths of ageism—older workers are highly employable" in the Seattle Times. I also invite you to contact your member of Congress and ask her or him to demand that this legislation move forward. The message is simple: Support passage of S1391/HR2582 and fairness and justice for older workers. Contributor Tony Provine completes his second term as chair of the Seattle-King County Advisory Council on Aging & Disability Services. For more information about advocacy efforts, visit the Advisory Council's webpage and online toolkit. Employers, is your company age friendly for workers 50 +? Find out by taking the Employ Experience Assessment Quiz offered by the Workforce Development Council of Seattle-King County. Are you a mature jobseeker? Seattle residents can get extra support by registering with the Seattle Mayor's Office for Senior Citizens Age 55+ Employment Resource Center. All Seattle-King County residents can take advantage of WorkSource resources and services.